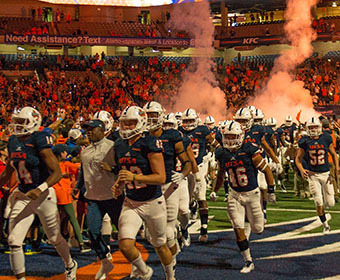 (Feb. 6, 2019) -- UTSA head football coach Frank Wilson announced today that he has added nine decorated student-athletes to the program’s 2019 signing class. Those added to the signing class include: Joshua Cephus (Spring, Texas/Dekaney HS), Cedric Claiborne (Houston, Texas/Westfield HS), Christian Clayton (Fort Worth, Texas/South Hills HS), Zakhari Franklin (Cedar Hill, Texas/Cedar Hill HS), Dywan Griffin (New Orleans, La./Landry-Walker HS), Trevor Harmanson (Dickinson, Texas/Blinn CC), Ahofitu Maka (Honolulu, Hawai’i/Independence [Kan.] CC), Antonio Parks (Reserve, La./Arizona) and Dominic Sheppard (Miami, Fla./Virginia). This crop of talented athletes joins 13 student-athletes who inked with the Roadrunners during the early signing period in December. The incoming class features 13 offensive players, eight who will line up on the defensive side of the ball and one specialist. Of the 22, 14 come from the high school ranks, while six are joining the Roadrunners from junior colleges and two are transfers from four-year schools. The incoming class includes 12 players from the state of Texas, four from Louisiana, two from Florida, one each from Georgia, Hawai’i and Mississippi and UTSA’s first-ever player from Australia. Among the dozen players from the Lone Star State, five hail from the Dallas-Fort Worth Metroplex, three are from San Antonio, three come from the Greater Houston Area and one is from West Texas. “We start each signing day by making calls to each one of these young men’s families and coaches to thank them for their diligence and for allowing us into their homes and schools,” Wilson said. “This is also an opportunity to recognize the families of our coaching staff who have sacrificed so much while our coaches have been on the road recruiting. Additionally, two blueshirts in Cassius Grady and Gavin Sharp, who signed last summer and played during the 2018 season, were pushed forward to count toward this class, bringing the total number to 24. Learn more about the UTSA Football 2019 signing class.